See the FreeTrack Wikipedia page for a general overview. Which point model configuration should I use? There isn't a great deal of difference between them, the 3 point clip is a vertical configuration for headphone mounting and the 3 point cap is for baseball caps. 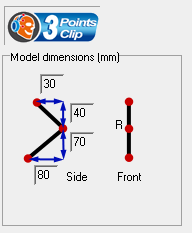 The 3 point clip has some extra calibration controls to minimize unwanted translation due to the off-centre position of the model. Which webcam should I use ? Lot of webcams have already been tested by FreeTrack users. Go to the webcam compatibility list to check out the member's mind. If you have tested a webcam which is not in the list, please post your feedback in this ]topic. Which dimensions should I use when I build my model ? Are there any special considerations for the 3 point cap model? The plane defined by the 3 points should never get close to being parallel with the camera plane (normally a vertical plane) when pitching downward, otherwise tracking becomes extremely unstable. This can be avoided by moving the model's middle point further back and/or reducing its height. 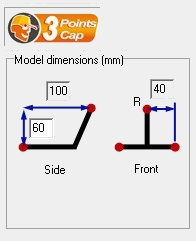 Can the middle point of the three point cap be forward of the other two points instead of behind? Yes, as long as it is forward enough to avoid the above mentioned special consideration, yaw and pitch will be opposite so you'll need to invert them in your profiles. What are the advantages of using the 4 point model? None, it was the first tracking method in FreeTrack and remains for compatibility reasons. Why should I use infrared Light Emitting Diodes (LEDs)? Cameras can see infrared LEDs better than normal ones, they can be better isolated from visible light using filters and they are discrete, emitting no visible light that could otherwise be distracting. What colour LEDs should I use? If you're not going to use infrared LEDs then the next best thing is standard red LEDs because they are closest to the infrared spectrum. Which is better, 5mm LEDs or 3mm LEDs? The larger 5mm LEDs give better sub-pixel tracking accuracy. The LEDs fade away when I turn my head only a small amount. The viewing angle of your LEDs is too small, increase the viewing angle by filing the LED lens tips down flat, almost to the metal part and then make the final finish transparent matte (not too shiny, not too rough). Alternatively you can buy wide angle IR LEDs like SFH485P or equivalent (+/-40 degrees half angle). These LEDs are unlikely to be available from consumer electronics shops, instead try major distributors like Farnell and RS Components or through a specialist like LumiTronix. I can't find SFH485P LEDs or the shipping costs are more expensive than the LEDs themselves! Just use standard, widely available infrared LEDs, their viewing angle is too narrow for head tracking but this is easily fixed by filing the lens tips down flat. This reduces their brightness due to a wider emission angle but they're still no less bright than commercially bought wide angle LEDs like SFH485P. My LED's specification says it's forward current is 100mA. So that's what i should input in the LED Assembly wizard? This value is LEDs maximum rating, meaning that it's the maximum current that won't damage the LED. Anything higher may cause permanent damage. My LEDs are heating up. Is that normal? Most of the LEDs can operate in temperatures up to 100 degrees Celsius without risk of taking damage. LEDs heat up when they are driven with high current (close to, or above maximum rating) which is unnecessary unless you have a good reason for it (like a reflective system). See question above for recommended current values. I want to use USB to power my LEDs. Attempting to use USB as a power source can permanently damage your motherboard if you're not careful, if you feel competent enough to use it, make sure you include a PTC fuse with a 0.2A current cutoff in your circuit as insurance. Can I use reflectors instead of LEDs so I don't need to have wires or batteries attached to my head? Yes, but tracking won't be as reliable in the presence of background light. In this configuration, an array of focused IR LEDs is positioned near the webcam, pointing towards the user so that they illuminate the reflective tracking points. Since they don't reflect as brightly as active LEDs, the webcam's IR filter needs to be removed so that they can be better seen and isolated. The reflectors should consist of retroreflective material like that used in safety clothing as it has a diffuse but still bright and directional reflection. Ball shaped reflectors can be used to ensure the reflection appears the same no matter what the orientation. Do I really need to use a visible light filter? In most cases, yes, since the tracking points need to be completely isolated from all other light. A visible light filter is not required if the room is very dark or a webcam's IR filter is removed and its exposure set low enough that background light does not interfere. What can I use for a visible light filter? Photographic filters are too expensive! A high quality photographic filter would be overkill for webcam head tracking. If you're using a webcam that hasn't had its IR filter removed you should use exposed developed photographic film. This is a relatively weak filter so multiple layers may be required but keep in mind too many layers can cause unwanted blur and ghosting. Click here for more details about using film as a visible light filter and a plot of the spectral response. For a modified webcam without an IR filter you should use the magnetic tape from inside old floppy disks. This is a strong filter so only one layer is required. FreeTrack sometimes loses the tracking points or background light interferes with tracking in daylight. Adjust webcam exposure and the threshold slider in FreeTrack to find the best compromise between tracking point isolation and brightness. If you've done this and tracking still isn't reliable or if you want the best possible tracking you will need to modify your webcam by removing its IR filter. How do I remove my webcam's IR filter? In most cases the filter is a separate component such that removal is reversible. If it's a special lens coating then removal is non-reversible, the coating can only be worn/polished off, taking care not to damage the webcam optics. Filter removal guides for some webcam models are available here. These can also be applied to other webcam models because the procedure is largely the same. I couldn't find an IR filter in my webcam and it seems to pick up IR just fine. The sensor in a digital camera is very sensitive to IR light, moreso than visible light, this is normally unwanted so the sensitivity is reduced by using an IR filter. Absolutely all normal visible light digital cameras, including webcams, have an IR filter. If you can't find it, you're not looking hard enough, in the case of webcams if it is not a special lens coating then it is normally inside or attached to the lens housing. IR filters attenuate or reduce the intensity of IR light, in some cases to the point of entirely blocking it but often the filter does not cover the entire IR spectrum and has a gradual transition between minimum and maximum filtering where the IR light is only mildly attenuated. This is why cameras can easily see the light from IR LEDs; it has been attenuated but not entirely blocked. Removing the IR filter increases IR sensitivity significantly and in the case of FreeTrack allows the tracking points to be better seen and isolated. The tracking points appear as big blobs. FreeTrack won't correctly track points that are too large. Reduce webcam exposure and increase the threshold slider to reduce light bloom. Also make sure your webcam is not too out of focus; tracking is better when the points are only a little out of focus. Focus is normally adjusted by manually turning the webcam's lens ring. When the LEDs aren't pointing directly at the camera different parts of the LED's lens body are being tracked. Make sure only the front faces of the LEDs are visible by wrapping some black electrical tape or heatshrink around their bases. My webcam's frame rate is too low. See the Software FAQ for frame rate issues. Can I use a Wii Remote's camera with FreeTrack? The Wii remote's camera is supported since FreeTrack 2.2. Can I use a not Nintendo branded Wii remote ? The WU-Brand Wii Remote has been reported as not compatible with FreeTrack. Other non official Wii remote may not work. Can I use my TrackIR camera with FreeTrack? disable on FreeTrack 2.2.0.278 and newver. Yes, you can use it with the latest FreeTrack version. Check the documentation to know how to get it working. I've read the documentation but still can't get my TrackIR camera working with FreeTrack. disable on FreeTrack 2.2.0.278 and newver. Instead of using the latest Optitrack version, try Optitrack 1.1.034. Edited by didja on 16/11/2008 at 19h56.